Once I'm on a roll, I just want to keep going. It was time to do the hem. I measured from the bottom seam of the casing and marked where Carole said the sill for her window would be. That left me with a hunk of excess fabric. Leave it to me to get the amount I needed wrong. But at least I erred on the side of more and not less. Once I measured three times, I marked where the bottom of the hem would be on the sill. 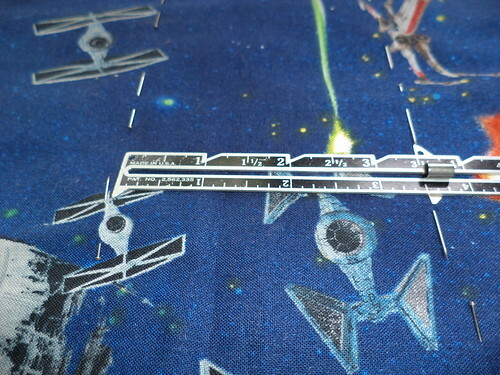 Then, I added 3 1/2 inches for a robust hem. 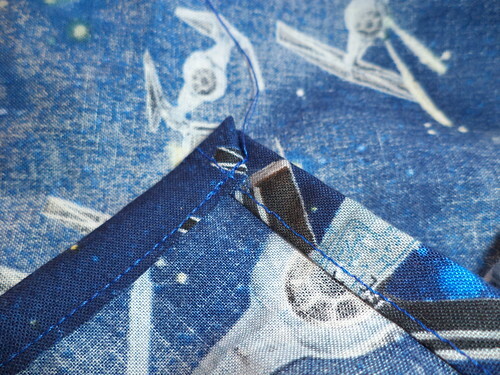 Pam pointed out that the weight of the hem will help hold the curtain down, something I had not considered. 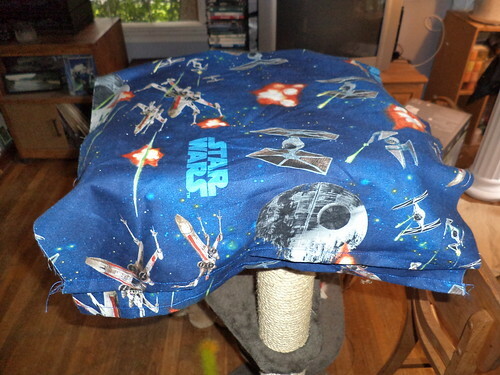 I was just going to make a quick one inch hem, but the curtain would not have hung straight. Armed with this knowledge, I pinned a turning line for the final hem and a cutting line to remove all the excess fabric. I check, rechecked and checked again both of these lines before cutting. It always makes me nervous when I have to chop off a chunk. What if I got my measurements wrong? But I was going by Carole's notes and I had purchased excess which couldn't be folded into the hem. I just told myself it would be okay. 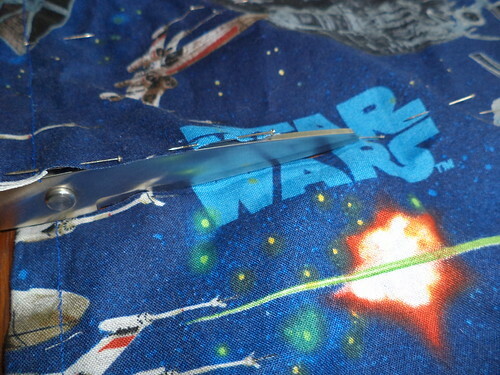 Once the excess was trimmed, I marked and sewed a half inch hem. Corners were mitered so there wasn't a stray thread in the finished hem. 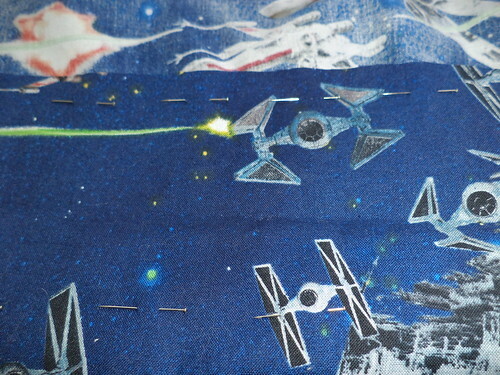 Then, it was turned up along the original pinning for the final length. I tucked in the corners if necessary. On one side I had to but on the other side, I did not. 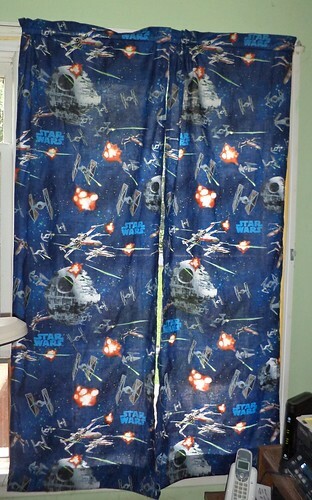 Here is the finished curtain hanging on the rod in my home office. I'm rather pleased with the final result. I sent this photo to Carole and she likes them too. That's good. It would have been unpleasant if she didn't like them. So I have these two pieces of fabric left over. I'm thinking I could make a cat bed from them. 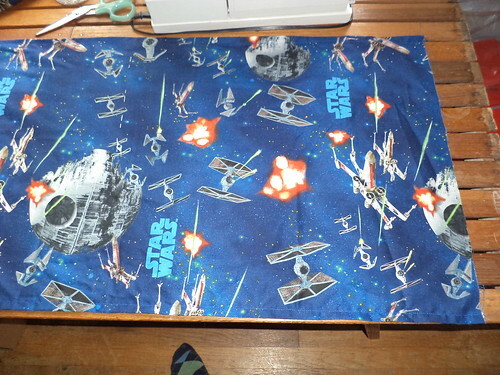 If I put quilt batting between the two pieces and sewed the whole thing together in maybe an "x" pattern, the result could just be tossed into the wash when needed. 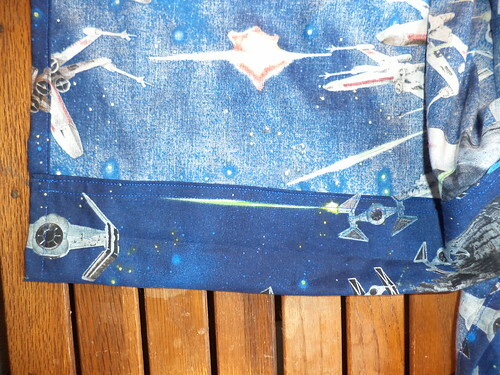 I'll start a new set of curtains tonight and I'm pretty sure I'll have excess fabric with that piece. 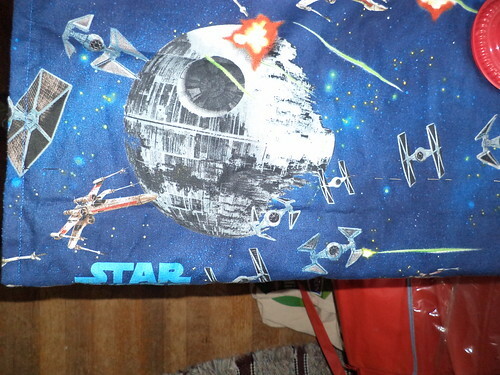 The other thing with the deep hem. When they are hung up, if it turns out they aren't long enough, there's plenty of fabric to lengthen the curtains. I do have one puzzlement. I pulled this color thread out of the machine when I was gearing up for these curtains. 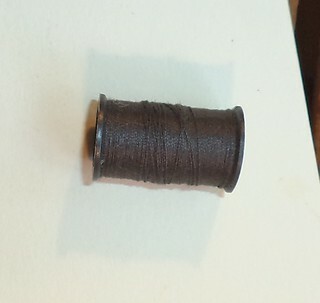 What was I sewing that required the use of chocolate brown? I have no idea. I will admit it has been awhile since I used my machine, but I'm clueless as to what I made or fixed prior to these curtains. Oh well. I'll be pulling the royal blue and using black for the next set.